The East Kootenays is home to many fruit trees. When the fruit is left to fall off the tree and rot, it attracts local wildlife—including deer and bears. Wildsight’s Apple Capture is here to help you keep up with your fruit harvest or to share it with someone who can use it. Together, we can turn a wildlife attractant into a locally sourced, nutritious food. We lend out fruit picking, juicing, preserving and tree pruning equipment. We have a tree sharing board. We organize community picking and juice pressing events. You can use Apple Capture equipment to pick, juice, sauce and dry your harvest or to prune your trees. We have juicers and grinders, dehydrators, sauce making kits, and apple peeler / slicer / corers, plus regular ladders, tall orchard ladders, special fruit picking bags, extensions and hand pickers. We also have pruning equipment to keep your trees in good shape: pole pruners and saws, hand saws, and loppers. Access Apple Capture Equipment Bookings here. All you have to do is create a new account. 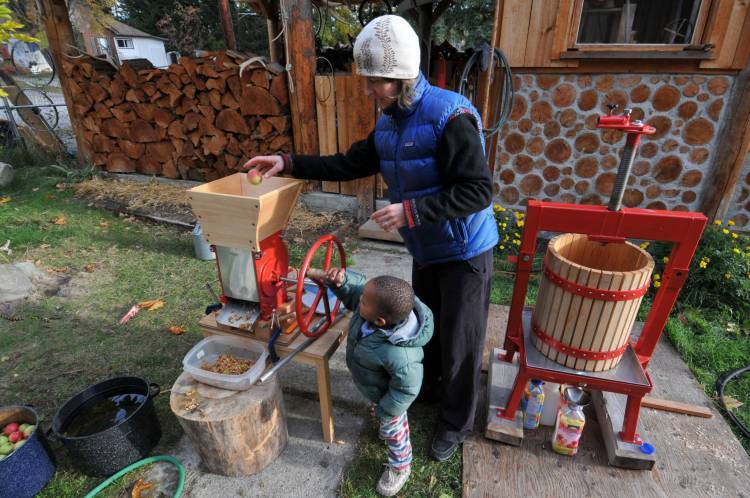 If you are pressing apples, the pressing leftovers can be used for animal feed. Get in touch with us to find out how. Do you have a fruit tree that you don’t have the time to harvest and would rather have someone else pick? Are you looking for fruit trees to harvest? Visit the Tree Share Board to get started.